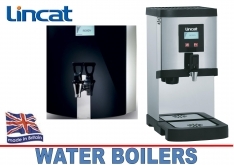 Stainless steel water boilers by Lincat offering high build quality and fantastic back up. We offer you built in filtration, great insulation reducing running costs, non drip taps and LCD panels. 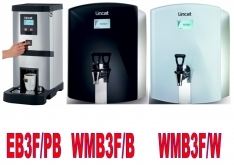 Here the full choice and all at great prices with free delivery and on-site guarantee..
EB3F: 9 litres, 55 pints, 60 cups, filter, W290xD465xH652, 3kw.